In a world where many businesses are focused on becoming more high-tech, Little Daisy Bake Shop has gotten back to the basics with old-fashioned, no nonsense baking. 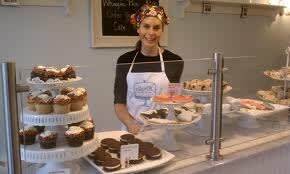 Since opening the store in Montclair, N.J., in 2011, founder Jennifer Snyder has been focused on making great tasting baked goods with real ingredients. She doesn't need xanthan gum or other foreign food ingredients found on many store-bought goods. Instead, she uses familiar ingredients, such as eggs, flour and butter. Her methods are old-fashioned but effective, and she's proud of that. The residents of Montclair have responded too. Since Snyder opened the doors of the Little Daisy Bake Shop two years ago, the business has already grown enough to move to a new location (four doors down) that's three times larger than the original spot. The expansion may be largely because of the bakery's many returning and regular customers. "The customers have been great. They order a lot," Snyder said. "We have loyal customers who come in everyday for a scone, and we know exactly what they want. We have customers who's birthday cakes we've been making for years." But the popularity of her baked goods are nothing new for Snyder. In fact, it's the whole reason she started the bakery in the first place. She started baking as a hobby – a birthday cake here and there. Not long after, a cake for her son's birthday party would turn into cakes for his friends and then nearly every birthday party in town. Rather than give up her hobby, Snyder decided to embrace it, expand and sell to the community. Now, in addition to birthday cakes, Little Daisy Bake Shop makes brownie cupcakes, butterscotch scones, ginger molasses cookies, banana bread, muffins and a bunch of other tasty desserts. Each treat is made fresh each morning, and they're all nut- and peanut-free because Snyder wants people with allergies to be able to come into her shop and not feel limited. "We have a great product because we make it fresh every morning," Snyder explained. Although everything is made daily, Little Daisy Bake Shop doesn't throw away uneaten food – the bakery marks it down to a dollar. Many customers still buy these discounted sweets because they're just as good, Snyder explained. If there are still treats available after one more day, they are sent to the the Montclair Emergency Services for the Homeless. Snyder doesn't just give back to the community by donating her food to the homeless. In 2011, shortly after she opened her store, much of the town lost power in an unexpected October snowstorm. Snyder responded by providing her neighbors and community members with hand-delivered baked goods to help people get through the night. "At 7 p.m., the doorbell rings and it's Jennifer Snyder dropping off some baked goods from her shop with a cute note for those who have no electricity," Christina O'Neill, neighbor and Montclair resident, told the Montclair Patch in 2011. "This woman has been up since 4 a.m. to make sure that her bakery has freshly baked scones, muffins and other delicious baked goods … she's had about maybe 4 hours of sleep. So the extra time she had she packaged these little bags of treats for those who are still in the dark and drops them off personally so that she can provide some light into their lives. She is just the best!" But Jennifer Snyder and Little Daisy Bake Shop are just those kinds of businesses and community members. They're thankful and happy to be part of Montclair, for the people, for the other businesses and for how everyone comes together. "I love [the neighborhood]. It's been super supportive of me and the business," Snyder explained. "I think it's been great, in the last couple years especially. The foot traffic has increased. And the support from the surrounding businesses has been great. I'm a customer of other businesses, and they're good customers of mine." As she explained in an open letter on the bake shop's website, families in town have welcomed the bakery into their celebrations and traditions, and that's significant. Snyder may become part of even more family traditions as her business continues to thrive and expand based on the simple idea of making the best tasting food from the highest quality ingredients.